From this week up until Christmas Eve, families have every reason to head to Baywest Mall for their shopping and entertainment. 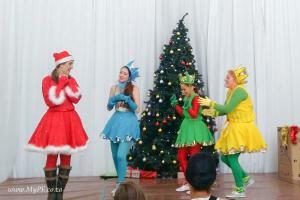 Baywest will be staging two Festive Season productions, both locally produced, to delight children of all ages. Crackers for Christmas will be presented by the Stageworld Theatre School, while the Nutcracker Ballet will be staged by the Friendly City Ballet company. The productions will run twice daily every day right up until Christmas Eve in the Baywest Mall main exhibition area next to the food court. Other children’s entertainment includes puppet shows and Maoz, the much-loved Bay clown. “The arts is the lifeline to any community, which is why Baywest Mall is bringing two quality, locally-produced shows to the Bay this December to entertain the young and the young at heart,” said Baywest Mall marketing head Samantha Hewitson. The 9am to 7pm weekday and 9am to 9pm weekend trading hours also means there will be more than enough time to find the perfect gift this Christmas. If, however, time is not on your side, let the Baywest team lend a hand. Send an e-mail to mygiftfinder[at]baywestmall.co.za with the age, gender and interests of that special someone you are shopping for. Let the Baywest team know your budget, and their Gift Assistant will make a shortlist of the perfect gift choices. Once you have made your decision, your gift will be set aside for you to collect and pay for at your convenience.